Are you prepared for things to not work? Are you willing to put yourself out there? Take the chance to Fail Harder. Wieden + Kennedy is an advertising agency that used 100,000 push-pin tacks to create an art installation in their offices. Check out this short video of it being made: Fail Harder. Pablo Picasso knew something about failing harder when he stated, I am always doing that which I cannot do, in order that I may learn how to do it. 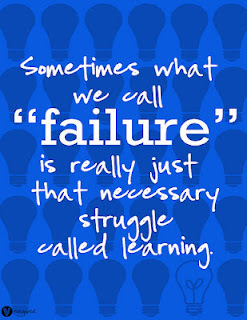 Failure is important to understand because success involves repeated setbacks. If you don't know how to welcome failure, grapple with it and ultimately overcome it, you're not going to develop your potential to the fullest. 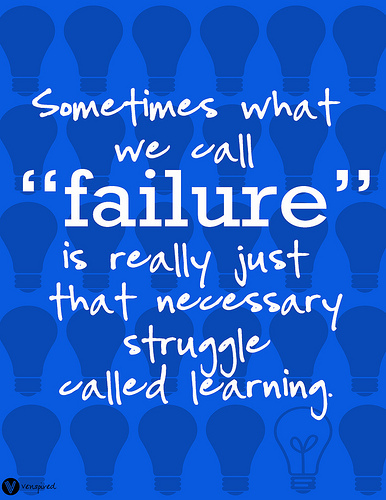 Students need to integrate a mistake or setback as not failure. Rather, just a step closer to realizing the attainment of a task, goal, or dream. We all need to look through a different lens so as to not perceive a setback or mistake as a failure.